The GAZ Group is charting a strong growth path by expanding into new territories. Entering automobile manufacture in 1929 by signing an agreement with the Ford Motor Company, the GAZ Group (GAZ) rolled out a pick-up truck based on Ford Model A in 1932. In return for the purchase of USD 13 million worth of automobiles and parts from it, Ford provided technical assistance until 1938 to construct an integrated manufacturing facility. On display at the GAZ museum at Nizhny Novgorod among a host of cars, vans and trucks (including the GAZ Chaikas), the Ford Model A pick-up truck makes an interesting reference point for the line-up of modern commercial vehicles the Russian auto major has come to offer. 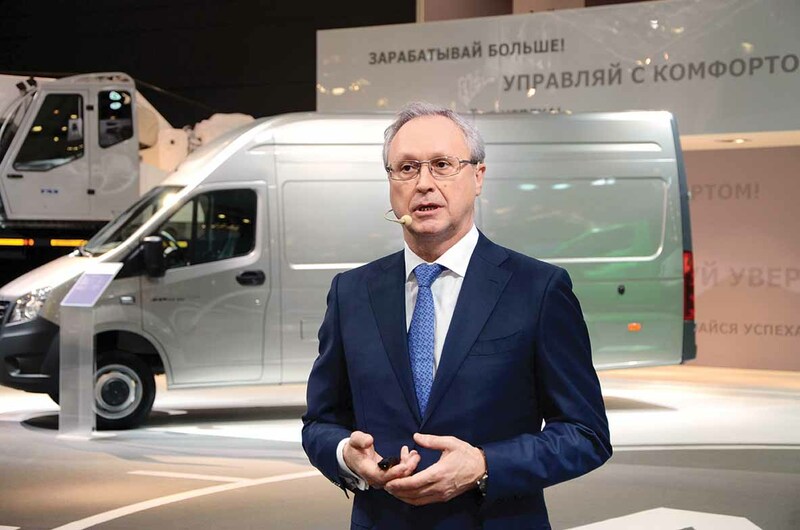 An LCV market leader in Russia with a market share of 50 per cent, GAZ offers not just a variety of LCVs, but also offers a variety of heavy commercial vehicles. 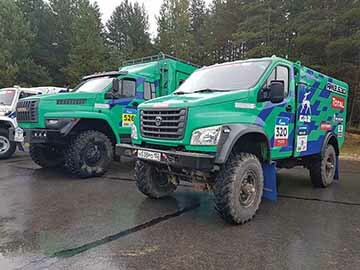 These include the Gazelle, Gazon, and Ural trucks; buses and a new aspirational range of vehicles like the Sobol and Vepr. 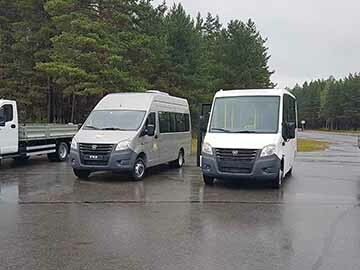 If the Gazelle, Gazon, Sobol, and Vepr form the light and medium commercial pick-up and van range of the Russian CV major, the Vector, PAZ, KAVZ, Liaz, Urban Cruise, and Voyage form the range of buses the manufacturer offers. They measure between 5000 mm and 18750 mm and make GAZ the largest manufacturer of buses and coaches of all classes and types in its home country. The buses are produced in plants at Likino, Pavlovo and Kurgan. 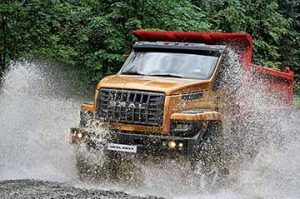 The heavy truck range consists of the Ural range. It comes with an engine in front of the cab configuration, and in forward control configuration. 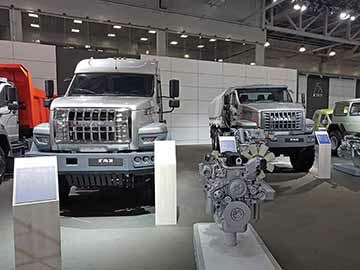 Available in various length and axle combinations, and in all-wheel-drive forms too, the Ural heavy trucks, according to Vadim Sorokin, GAZ Group President, are offered with roughly 300 superstructures. On the Gazelle chassis, there are over 450 superstructures. The Gazon medium truck range is available with 150 superstructures. Encouraging its partners to buy chassis and establish the production of superstructures, the Russian CV maker has, since inception, been creating jobs. It is leveraging its association with partners to promote its products; to offer customers a variety of configurations that include the building of some very special cab-chassis superstructures. In the case of mini and midi-buses, the chassis is engineered such that it supports the building of superstructures to cater to a variety of application needs. With an emphasis on vehicles that address the needs of the customers better than others, GAZ has come to offer a product portfolio that is robust, modern and on par with what is offered in other parts of the world. Using technologies of leading global suppliers, the company is also learning global ways of working by contract manufacturing vehicles for Daimler and Volkswagen. With a particular interest in special application vehicles like ambulances, mobile repair vans, platform evacuators, auto hydraulic lifts and milk tankers, the Russian auto major is applying industry best practices in its manufacturing processes. 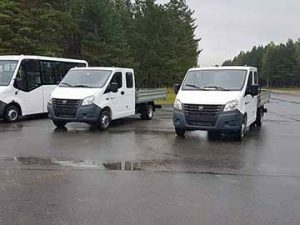 Contract manufacturing the Sprinter van for Daimler, Volkswagen Jetta and Skoda Octavia (and Yeti) for the Volkswagen Group, GAZ, at the Gorky Automobile plant in Nizhny Novgorod, produces its Gazelle range of vans alongside the Mercedes-Benz Sprinter van range. The two are built by the same people and are based on the same standards. Having set up a training centre at Nizhny Novgorod in association with Volkswagen to improve manufacturing skills of the workforce, GAZ has upgraded its assembly, body and paint facilities with an investment of over Euro 500 million along with its partners. Particular attention is being paid to quality and lean manufacture. Said Sorokin, “We have invested USD 80 million to modernise tooling, stamping and welding.” Emphasising on the manufacture of 15000 medium trucks and 8000 Ural heavy trucks, he averred, “It is the manufacturing upgradation and increase in quality that has made it possible to introduce new models.” Practising just-in-time to ensure clutter-free and efficient manufacture, GAZ is significantly profiting in terms of defect and downtime reduction. With commercial vehicles constituting the bulk of the revenue, GAZ is preparing to launch a 4.6-tonne Gazelle Next pick-up in the coming months with a bigger load body and higher payload capacity. It is also preparing to introduce a 20-seat bus on the Gazelle Next passenger carrier platform. The two launches, according to Sorokin, will propel GAZ into segments it has never had a presence in. The company, to support such endeavours, has substantially upgraded the Gazelle platform – the chassis, brakes, axles, suspension, engine, etc. The engines that power GAZ commercial vehicles are produced at Yaroslavl. 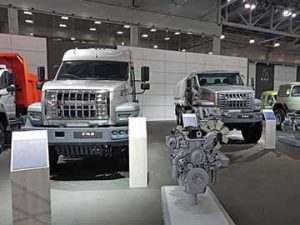 The Yaroslavl Motor Plant (YaMZ) Autodiesel is claimed to be the largest Russian motor manufacturer. A GAZ Group entity, it makes engines that find application in over 300 vehicles, in off-highway equipment and in diesel-electric stations. Preparing to invade a new market segment with the 10-tonne Gazon medium-duty truck, GAZ will have Hyundai and Isuzu as competitors. Success, Sorokin is confident, will come from the new truck’s ability to offer superior uptime and low cost of ownership. 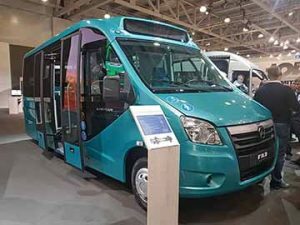 With the support network consisting of 1,183 spare parts outlets, GAZ, at Comtrans 2017 expo, displayed an electric bus concept based on the Gazelle Next (A68R5E) platform. It reflects upon the company’s electric vehicle strategy. Pointing at a study undertaken by an European automaker, which revealed that electric propulsion is not as good as it looks from an environmental point of view, and would cost to develop a battery as much as it would cost to operate a diesel engine for 200,000 kms, Sorokin averred, “This is just about the battery. 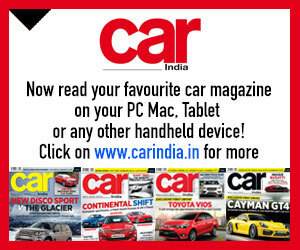 I find the solar energy to be among the cleanest technologies available.” Expressing that the battery has to be definitely utilised after its life is over, Sorokin opined, “The cost of the battery and its utilities have to be considered too.” Looking at autonomous driving technologies other than electrically power vehicles, GAZ is betting on gas-powered CVs. An abundance of gas in Russia, according to Sorokin, would make gas-propelled vehicles more practical than electrically propelled ones. Pointing at the operating environment where temperatures of (-) 20 degree Celsius would demand 80 per cent of the electrical energy to heat the windshield and mirrors among other utilities, Sorokin underlined the need for vehicles in Russia to operate in adverse weather conditions. Apart from electric propulsion technologies, GAZ is also banking on gas propulsion technologies for the future. The confidence of the company that gas technologies will prove to be more beneficial stems from the fact that gas is available in abundance in Russia. It also stems from the fact that a big infrastructural change will be needed to support electric passenger transportation. 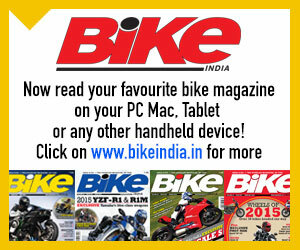 “To propel so many (electric) vehicles, a huge amount of electricity will have to be generated. 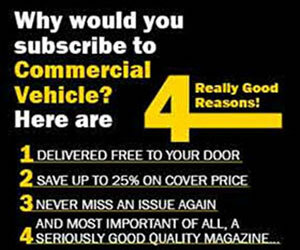 It then will have to be fed to each vehicle,” said Sorokin. He remarked that electric vehicles will take some time yet to gain the lower ownership cost status the current GAZ CVs have come to account for. 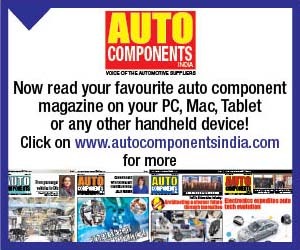 Using zinc coated steel to build bodies rather than use it to build a few, key body parts, the Russian auto major is enjoying a good brand following. With GAZ CVs claimed to command a good resale value, the company is expecting a strong demand for its CNG powered vehicles to emerge. While CNG is available in Russia at low prices, GAZ is banking on a rapid rise in CNG infrastructure. Stated Sorokin, “We need over 3000 CNG filling stations.” Supplying CNG buses since 2000, the company has come to develop one of the most successful CNG engines. 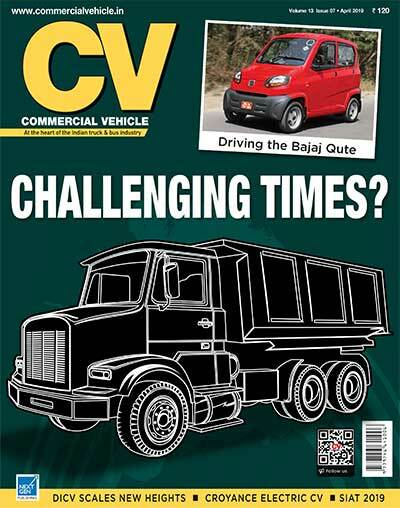 Available in four-cylinder and six-cylinder configuration, the CNG engine is actually a range of engines that could propel a variety of CVs, including buses and heavy-duty trucks. GAZ also supplies CNG engine to others. The diesel engines that the company makes find use in diverse application areas including locomotives. Finding the European markets interesting from the customer’s point of view, GAZ is finding the cost of entering the European markets high. Hoping to overcome this deterrent, the company, well aware of how well protected the European markets are in terms of duties and technical requirements, is looking at markets that promise good opportunity. Looking at increasing exports by 10 per cent at least in 2017, the CV maker is looking at African, Middle East, Asian and Latin American markets. Clocking sales in Bolivia, Cuba, Serbia, Jordan, Madagascar, and many other countries, GAZ has entered into an agreement with Eastern Petroleum Group of Philippines to export 17-seat Gazelle Next minibuses and Gazelle Next Cityline buses. They will be a part of the Philippines Government’s initiative to replace obsolete buses with new ones. 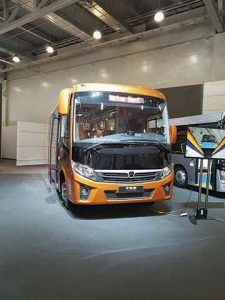 With the launch of Gazelle Next all-steel cargo and combi van in Turkey this year, GAZ is aspiring to be among the top five CV makers in the next five years (it is currently in the top 10).